By mid- 2002, almost half of Hong Kong's population had used the Internet. A number of factors have contributed to Hong Kong's high level of Internet usage, including the country's early connection to the Internet, in 1991, and few financial barriers. Hong Kong is one of the wealthiest economies in the world and Internet access prices are low compared to income levels. In 1998 Hong Kong was also one of the first economies to launch broadband services and the take-up of the high-speed technology has been impressive. Dial-up subscriptions are declining and the majority of Internet users have a high speed access. This has also contributed to intensifying Internet use. 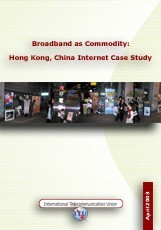 A 2001 survey ranked Hong Kong second globally in terms of time that people spend on the Internet. Hong Kong achieves top ranking both in broadband Internet (for which it is placed second, globally, behind the Republic of Korea) and for second-generation mobile penetration (for which it is third in the world). A major factor contributing to Korea's ICT success story is the government's commitment to competition in all market segments. In the mobile sector, Hong Kong has one of the most competitive markets in the world. Despite a relatively small market size (of 6.7 million people) there are now six mobile operators holding eleven analogue and second generation mobile licenses, and a further four third generation (3G) licenses. A mission to Hong Kong was carried out from 3 - 6 December, 2002, involving Michael Minges, Esperanza Magpantay, and Tim Kelly. The mission and interviews were coordinated by the Office of the Telecommunication Authority.